It is our understanding that you currently face a decision about whether to hold your 2016 forum in the Lao PDR. Please allow us to share our experience and concerns in this regard. In the lead up to the ninth Asia-Europe People’s Forum (AEPF9) held in 2012, there were also many who questioned whether the Lao PDR was a suitable venue. Others, including Sombath Somphone, who was serving as the National Co-organiser, argued that while there may be challenges, it would be a very good opportunity for Lao civil society to develop both internally as well as in its international relations. The AEPF9 aims to enable a secure environment that encourages learning and reflection and provides space for open, respectful, diverse and constructive debate. We support harmony, compassion and understanding, whilst recognizing the strength of diversity and solidarity for peaceful and sustainable development. Ahead of the next APF in 2016, the forum’s organizing committee has not decided whether to hold the meeting in Laos, which will assume chairmanship of the 10-member ASEAN coalition next year, because civil society groups from the region are concerned about the safety of human rights defenders in the country. Freedom of religion and expression topped the areas of discussion for Vietnamese civil groups attending forums on the sidelines of an Association of Southeast Asian Nations (ASEAN) summit in Malaysia Friday, during which they engaged with their counterparts and government officials from the region. The ASEAN People’s Forum (APF) is being held on April 21-24 to provide civil society groups with a platform to address the organization’s leaders through workshops on various rights issues alongside the ASEAN Summit of Heads of State. One young Vietnamese presenter, Nguyen Anh Tuan, told RFA that she attended the seminar because she wanted to convey how poor Vietnam’s rights record is compared to other nations in the region and discuss ways to improve it. “Based on what I know, the human right abuses in Vietnam exceed other countries like Malaysia, Indonesia, and Thailand,” she said. Malaysian politician Azmin Ali. Pic: AP. 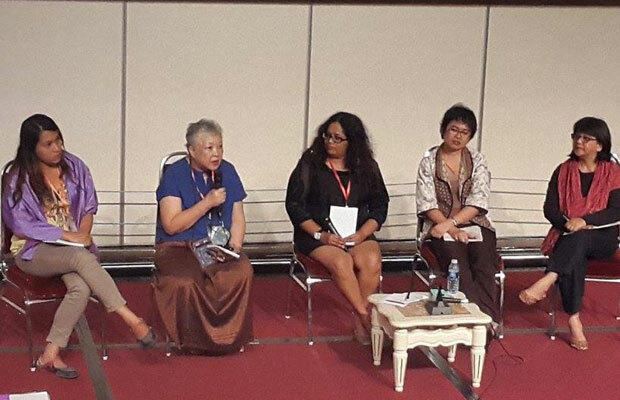 Discussions about human rights and civil society’s role in the ASEAN community took center stage at the ASEAN Civil Society Conference/People’s Forum in Kuala Lumpur this week. More than 1,000 people gathered at the conference, which began Tuesday and ends today. Civil society organizations in Laos are under pressure to omit key concerns from a list of regional human rights issues to be raised on the sidelines of an Association of Southeast Asian Nations (ASEAN) summit in Malaysia this week and “fear for their safety” if they attempt to do so, a CSO official said Wednesday. The groups dare not raise the concerns during the April 21-24 ASEAN Peoples’ Forum (APF)—intended to provide civil society with a platform to address ASEAN leaders—because they fear retribution for criticizing government policy, the CSO official told RFA’s Lao Service. “[The CSOs] will talk mostly about gender roles only, but not other issues such as land rights, the impact of hydropower dams … and enforced disappearance, because they are afraid for their safety,” he said, speaking on condition of anonymity. 2.2.3 States and non-state actors continue to commit violations with impunity, including police brutality, torture and enforced disappearances, against civil society activists. For example, the lack of immediate and transparent investigation into the case of Sombath Somphone by ASEAN governments, the ASEAN Intergovernmental Commission on Human Rights (AICHR), or any other human rights mechanisms in the region. Human rights defenders continue to be persecuted under oppressive laws, including laws against activities as “injuring the national unity”, “propaganda against the State“, “abusing democratic freedoms” and sedition laws, which deny the people safe and constructive political space. Sombath Somphone, an internationally acclaimed community development worker and prominent member of Lao civil society, went missing on 15 December 2012, when police stopped his vehicle at a checkpoint in the capital. He was then transferred to another vehicle, according to police surveillance video, and has not been heard from since. Reports say that the Lao government continues to deny responsibility for his disappearance. From Reclaiming the ASEAN Community for the People, the CSO Statement for the 2015 ACSC/APF. For Para. 2.2.3, on page 2 the sentence containing the individual name of Sombath Somphone and the related footnote must be completely deleted because in any statement we just point out the fact and suggest recommendation and for avoiding unwilling or detrimental consequences, we never put in the name of individual nor we name of specific country. Furthermore, in LAO PDR few people know Sombath Somphone. He is known as a simple Lao citizen and as a development worker, but not prominent as pretended in the footnote. He has established a none registered Association. He does not elected as leader of Lao CSOs. The facts are there. …This is the determinate voice of Lao people concerning ASEAN CSOs STATEMENT. Once again the People of LAO PDR hope that the sentence of multi-Party and pluralistic system and the other sentence with the individual name of Sombath Somphone, the word LGBTIQ and also all the footnotes shall be deleted or erased from the final Statement prior submission to the high level ASEAN LEADERS during the interface event. From a resolution allegedly resulting from a meeting of Lao CSOs held on 10-11 March, 2015. This month they are specifically to confront Laos with the issue of the enforced disappearance of prominent activist Sombath Somphone. When ASEAN holds its 26th Summit later this month in Kuala Lumpur, the association’s civil society conference and peoples’ forum will jointly issue a stinging rebuke. The missing Laotian civil society leader Sombath Somphone will be at the forefront of the conversation at the ASEAN Civil Society Conference/ASEAN People’s Forum meets in Kuala Lumpur next month. Sombath is a victim of enforced disappearance, and was kidnapped in Vientiane, Laos, in 2013. The Laos government has consistently denied involvement or refused to provide real information about the missing civil society leader, and his case has come to represent one of the most egregious human rights offenses still committed in the ASEAN countries. Lao activists are crying foul at a stealthy, failed attempt by their government to delete the disappearance of the country’s most prominent civil society leader from the list of regional human rights issues to be discussed on the sidelines of the Association of Southeast Asian Nations (ASEAN) summit in Malaysia next month. The activists say a retired Lao government official served as a proxy for the authoritarian government in Vientiane and lobbied the ASEAN People’s Forum to erase the name of Sombath Somphone, a prominent civil rights leader who has been missing for more than two years, from a list of human rights and governance problems in Southeast Asia. Sombath went missing on Dec. 15, 2012, when police stopped him in his vehicle at a checkpoint in the capital Vientiane. He was then transferred to another vehicle, according to police surveillance video, and has not been heard from since. Rights groups suspect that Lao officials were involved in or aware of the abduction of Sombath, who received the 2005 Ramon Magsaysay Award for Community Leadership—Asia’s equivalent of the Nobel Prize—for his work in the fields of education and development. The Lao government does not want the Steering Committee of the ASEAN People’s Forum to include Sombath Somphone’s name in the CSO Statement for their meeting to be organised in Malaysia on April 21-24, 2015. Mr. Maydom Chanthanasinh, a member of the APF committee from Laos, recommended to other members to remove Sombath from the statement, particularly the reference to enforced disappearance and human rights violations, according to a CSO staff. The recommendation to remove Sombath’s name came from a meeting for CSO representatives held on March 10-11 in Vientiane. The meeting, to “exchange information between the state and CSOs,” was chaired by the Minister of Home Affairs, Mr. Xaisy Somtivong. According to one staff, towards the end of that meeting the Chair asked whether Sombath’s name should be removed from the APF statement. About 20 out of 100 persons present raised their hands in agreement, but the Chair concluded the resolution had passed.